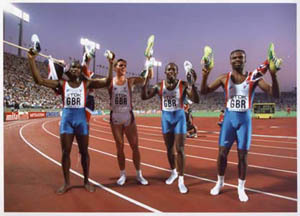 Derek Redmond and his fellow athletes at the Barcelona Olympics. 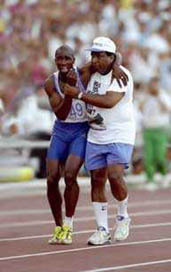 This is, without a doubt the most memorable photograph of Derek Redmond. It was taken at the Barcelona Olympics. Derek suffered a very bad Hamstring injury during the semi-finals of the 400m. He struggled to his feet and hobbled his way to the finish line with help of his father. The most, painful, agonising and heartbreaking 250 metres of his athletic career. Click on either photograph to read our interview with Derek Redmond.